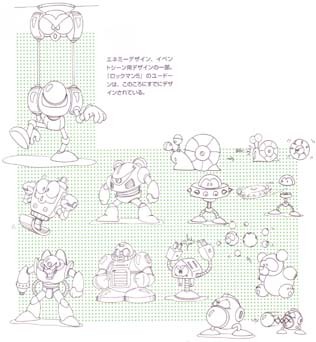 These characters were shown by Keiji Inafune himself in an internet interview and later shown in the Megaman Official Complete Works (aka Rockman 20) artbook. I traced some of the sketches shown to get a clearer view of them. Even though most of them are in the MMOCW artbook I'll leave these up here. Get the artbook for a clearer picture. Devilman? Bullman has also been suggested to me and makes more sense. One of many Smokema" designs. My Gassman guess was way off. I call this one "Inspector CreepyGuy" because he looks very creepy indeed. I can only guess at his intended role in the game. Some concepts for enemies in MM3. The snail idea would be brought back in MM4 and turned into a large boss (perhaps, at one point, there was an idea to bring in the small snail idea shown here) ... it seems like the snail behaves like the porcupine does in needle's level. Doc Robot is shown more menacing here than he would be in the refined sketches, similar to his NES mugshot (no pupils in his eyes). The large robot beside him would be brought back for MM5. The robot that one is an early version of the robot in Sparkman's stage; I guess they thought he'd be better off flying than stationary because that's is the largest thing changed in his design. From MMOCW. A sketch of the ... Rockbuster!? No info is given and even the Rockbuster is a guess. MMOCW again fills in the blanks. Evidently they had ideas for a bird support animal, but Rush was chosen instead. How pre-Beat would have played is unkown. The fabled Rush Drill. According to the MMOCW, "it seems like they were thinking about having the drill burrow through the stage map to make a path for the player." 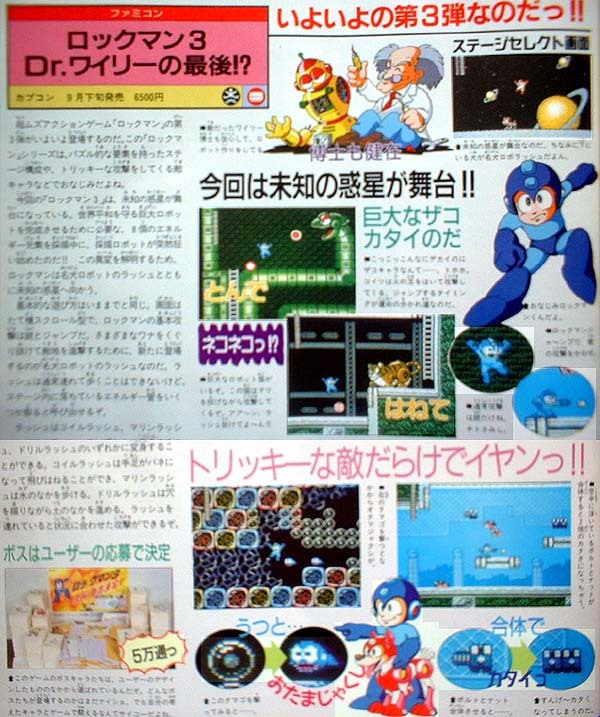 The Rush Drill was mentioned in early gaming magazine previews for Rockman 3, so it was probably either in the game or in the solicitations for a while before being scrapped and replaced by Rush Jet (which is very similar to Rush Marine). Which leads me to think the sprite probably looked something like Rush Jet's. Was Marvel VS Capcom's Rush Drill an in-house reference at this unused idea? Only Inafune knows for sure! Ironically, that Rush Drill bears a striking resemblance to Rush Marine! Protoman went through a number of changes as he evolved. The helmetless look probably lasted a while because there's an old Rockman 3 commercial that uses this design (albeit with a red scarf and not a yellow one) and it also appeared in the Rockman 3 manual. It was changed because they didn't want the player to think Megaman was attacking a human. Articafts of this still exist in the game, but ... more on that later. Source: The Warp Zone. This comes from Nintendo Game Secrets which was written by Russel DeMaria and Zach Meston. This one would seem pretty interesting - Magnetman's and Sparkman's mugs being switched leaves MANY questions to plaque us (namely was there ever a Doc Robot Magnetman level). 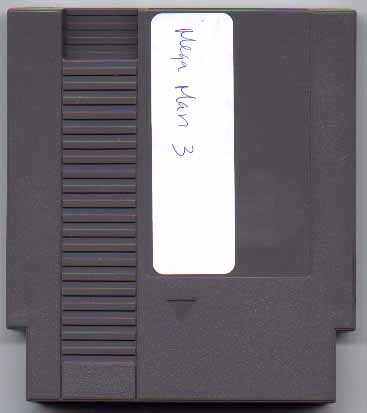 Upon closer inspection you'll see it says "Mega Man 3" and not "Rock Man 3". Clearly this is not a screenshot of the Rockman 3 prototype. It is possible that the developers made a fake "screenshot" to show to magazines (it's a common practise to do so). It seems obvious that Magnetman's mugshot truly belongs in the corner as opposed to where it ended up (Snakeman's mug and Needleman's mug show similar odd angles, so it's possible that they were switched around as well). Does this mean Magnetman's stage was once considered for a Doc Robot level? This particular screen shot seems to suggest it. So, why was the Magnet Doc Robot stage switched with Spark? Maybe because Metalman (who is emulated by Doc Robot) is MUCH more suited to Sparkman's stage than Magnetman's (because of the gearsint he background). But this is just a guess on my part. Chris Covell of (the aptly named) Christopher Covell Homepage has some amazing scans from Famicom Tsushin magazine circa 1990 ..... and with them some mind blowing info on Rockman 3 that he has agreed to let me put up in this article! The screenshots found in the article are more than likely completely unrelated to the stage select screen shown above. This is a scan of the article on the game featured in the magazine. The text features some standard information, however it's worth noting that it mentions Rush's three forms as 1) a coil 2) a submarine and 3) a drill. Also, it looks like Megaman's health bar is always full in these scans! 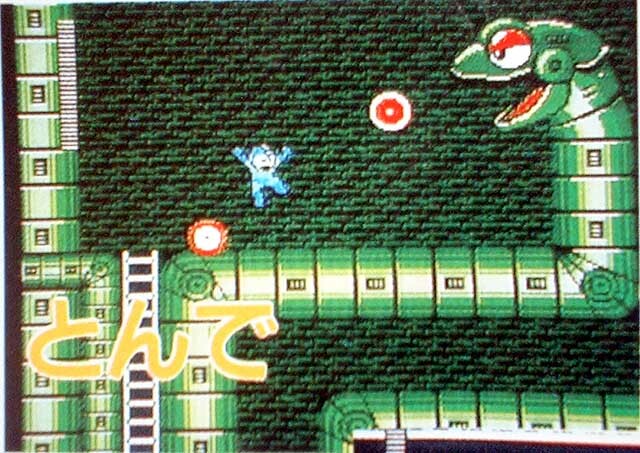 It seems most likely that the programmers made Megaman unkillable while they were working on the stages (that or that they were *master* Megaman players who never got hit even once which seems unlikely given the first Topman screen shot). Snakeman's realm remains virtually unchanged .... or has it? While the setting is identical to one of the large snake battles, the snake has a more robotic look in the beta! Also, the platform doesn't appear to be finished as it is still motionless at this point. It's worth noting that the Snake miniboss part of the level is unchangeable in rom hacking programs. The change in Topman's level is startling! Why they replaced this with his boring final level design I will never know. It seems likely that it was somewhere in the beginning, but no part corresponds exactly to where MM is standing. In fact only one of those platforms Megaman is on is still present in the final release of the game! It looks a little flat, so maybe that's why it was changed. Top Man stage change: they probably wanted lights to support the plantlife in the walls, they probably weren't satisfied with a first attempt at staticly drawn lights so they switched to an animated palette and started blinking the lights to make them come across as lights (and possibly provide a sorely-needed active element in the background). The NES only has 4 background palettes, so animating one of them left them with one less for drawing non-animated background stuff (anything colored with the blinking palette would blink), so they had to remove background elements which they couldn't do justice to with only the non-animated palette entries (keep in mind each palette has only 4 colors, of which 1 is shared across all 4 background palettes). If they realized they didn't like the end result, it may have been too late to redo all the graphics and cleanly remove the palette-animation code. Or they may have already filled the tile space used for all that nice latticework and pillar with other stage graphics. Perhaps it was lack of space for such detailed backgrounds which drove them to change to the final light panels which they then animated? Who knows? This screen is slightly different than the finished product (likely to stop Megaman from simply using Rush Coil or Jet to jump over the cat). "Lost a planet Master Obi-Wan has. How embarrassing. How Embarrassing!" Behold the skies! As noted before, it seems that Geminiman's level (at least the first part of his world, from all appearances) was revised greatly before the final release of the game! Aside from the gravel ground, there are planets! And what planets! Big ones and little ones. However, there is more than meets the eye here, as Geminiman's level in the final release still has the large planet in the game with palette intact! It's right in there in the final game and it's plain-as-day when you view the levels through a level editor, but when you play the game through normally the planet is cloaked! It's the same case with Gemini's Doc Robot Stage. Moreover, upon resizing the screenshot I find that the Beta planet is bigger than the one in the final release! It probably reuses some tiles to achieve this (which the final planet also does, although it's hard to tell). This particular scene also doesn't appear in the game at all! The ground isn't level for one screen long at any point, especially where the big planet is supposed to be! The exterior of Gemini's level doesn't appear finished at all (although, judging from the other screen shot on the preview page, the interior is very finished as that scene appears exactly as it is in the final). I must confess that I like the look of the final release better, despite all the mystery behind the beta version. The crystalline planet simply looks better than this rather plain landscape. although the giant planet ain't bad. More on the lost planet of MM3 later. Super jump, Navigate Bottomless pits - Hold right on controller two and not only will Megaman be able to jump high, but he will also be able to jump into and Navigate bottomless pits without dying, however if you wait too long you WILL die and sometimes Megaman does take damage while down there. Slow-mo - Hold up on controller two for slow moving animation. Hold up and A to completely freeze the animation frame for every sprite on screen. Sprites in motion still continue to move, but you can still shoot them with the arm cannon; it is only the frames of animation that are actually stopped or slowed down, not the movement itself. This can be combined with the jump trick mentioned above. Zombie Megaman - Jump into a pit. When you hear the death sound effect, quickly press right on controller two and get Megaman to jump out of there. He will have zero HP and thusly will not die from any more damage, but he will not be able to fire arm cannon either. Master weapons and Rush still will fire, though. Take an energy capsule to restore Megaman's health and allow him to shoot, however if you do this Megaman can once again die. Turn a weapon energy pellet or capsule into Rush jet/marine - First, find a weapon energy pellet or capsule (pellets offer less energy however). You must have either Spark Shooter or Shadow Blades. Select either Spark Shots for Rush Marine or Shadow Blade for Rush Jet. After selecting the weapon press right and Rush will appear. Press A or Start and then pick up the capsule You'll have to fill up Rush's energy manually and Rush will not appear on the subscreen until you get him for real, but this will let you access Rush early on in the game. All this info is taken from The Megaman Homepage. I'd feel a bit more bad about it, but it's not like it's new info to anyone. Why is this here? Because this is, most likely, left over data from the debug mode! Although the Rush tricks are likely just a bug. Also it lets us see the different ways they could test out a level - disable pits, enable long jumps, test animation frames by making them so slow that they're easy to see. Furthermore, the Zombie Megaman trick is easy to explain. Unlike other weapons, the Arm Cannon's value is ties directly to the value of MM's life. So, if your life runs out, so does the arm cannon! Naturally, this doesn't come into play in any instance except for the "Zombified Megaman" trick. The fact that these programmer's tricks are left in makes me wonder if the debug screen itself could be hacked into in some way. I'm guessing that the menu system is hardcoded and someone just goofed or forgot that column's check to test whether a weapon is obtained before selecting it. For simplicity, it makes sense to have slots and meters available for all weapons all the time and to have all weapons fundamentally available for use all the time, but to keep a set of flags to determine whether weapons have actually been obtained. Once a weapon has been selected, the main game shouldn't need to spend time caring whether you've acquired it when you try to use it- it's the menu's job to ensure the weapon is never selected if it hasn't been obtained. Thus, if you somehow ~do~ select an unobtained weapon, since it was there for you to use all the time provided you could select it, it's there for you to use and it has its own energy meter. You just need to put some energy in manually, because it wasn't flagged as obtained when you entered the stage and consequently wasn't topped off from its default contents of 0. Indeed, the default state is probably 0 energy on all meters with only Plasma 'obtained,' 'obtained' meters get filled at stage start, and at stage end the 'obtained' flag for a weapon is logical-ORed with whether the weapon's meter is not 0, hence the need for the ceremonial filling of a weapon's meter when you beat a boss. While Rush items may be activated manually rather than by end-of-stage meter-fill in a normal game (3 special cases being easier to manage than 11), there's no reason to special-case them ~out~ of the end-of-stage check, and the loophole theoretically allowing any prematurely selected and filled weapon to be registered as 'obtained' at stage end is simply not closed for Rush rather than being explicitly opened as part of a debug cheat. Cart pictures courtesy of The Warp Zone. The first cart pictures was bought by a guy named Kap and has a different sprite for one of the boss sprites (although which one isn't mentioned and it's odd that it would since it's a simple translation). No additional info was given for the second cart. 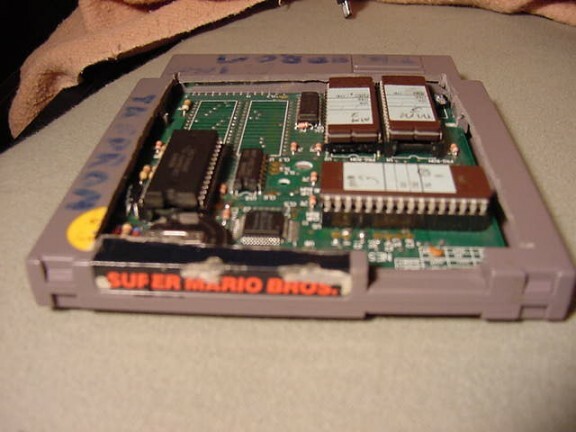 It's likely the first cart was used for the prototype rom dump. 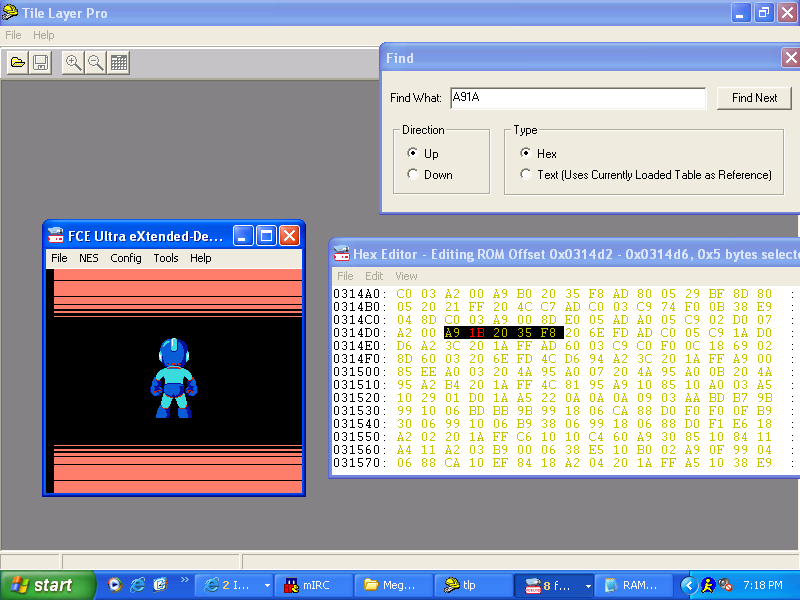 Yes, my friends ... a rom of the Megaman 3 prototype was found and dumped! 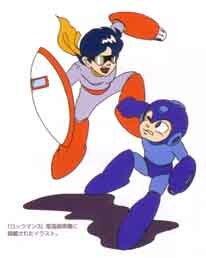 Don't get too excited though ... this is the Megaman 3 prototype ... not the Rockman 3 prototype. Basically, this is the rom as it was being translated by Capcom. And while nothing has REALLY changed, there have been some glitches in the graphics thanks to the translation process. Still, it's an interesting look at one step in MM3's history. 3 guesses what's wrong with this picture? Using Top Spin to defeat Shadowman. In this version, Megaman is frozen in the position he was in when he killed the RM. He's stuck! (Using ShadowBlade to defeat a Doc Robot). In the final MM snaps back into position. Using Rush Marine to defeat Doc Robot Bubbleman. In the final he just poofs out of Rush. Megaman moonwalks away from toy-Wily! Weird thing is, he walks right in the final battle. There's probably more glitches, but they all revolve around times when Megaman is forced to stop in place (as when he stops to listen to Protoman's catchy tune). Submitted by Mike aka Kuja Killer. Apparently the Magnet Missile was supposed to turn and not just suddenly change direction. 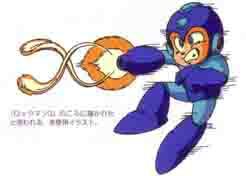 This sprite was later used in the Wily Wars. Magnetman's own Magnet Missiles also have this sprite included, but it's missing one of the tiles. Submitted by Mike aka Kuja Killer, an unused sprite of Snakeman. Nothing too exciting, but this is a sprite of Snakeman's tail pointing downwards while he's shooting / jumping. This sprite is never used as Snakeman's pattern does not allow for it suggesting that they might have programmed him differently at an earlier point or had his stage layout be somewhat different. Found by the Cutting Room Floor in Sparkman's frames. Looks like the smaller spark Shots were meant to freeze Megaman as Megaman's acquired weapon does to some enemies. In Megaman 3's game data, the room you fight Breakman in is NOT a totally separate level (like the Doc Robot stages), but rather a one screen extension of Hardman's room! I speculate that the inclusion of the Breakman fight was added in at a later point in the game's development, after all the other stages were complete. Found by Mike Mcmahon. An unusual piece of data makes a part of Rush Marine black - exactly where the mouth ought to be - when shooting. Additonally the Cutting Room Floor shows the Rush Marine shooting sprite is intact in the game. 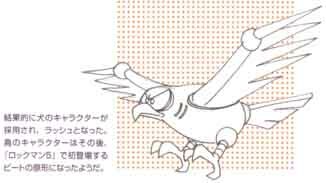 It looks like Rush's mouth was meant to open when he fires arm cannon pellets as he does in later NES MM games. For whatever reason, Rush does not do this in the game. The bullets just appear where his mouth is. In the Wily Wars Rush also does not open his mouth to shoot bullets. 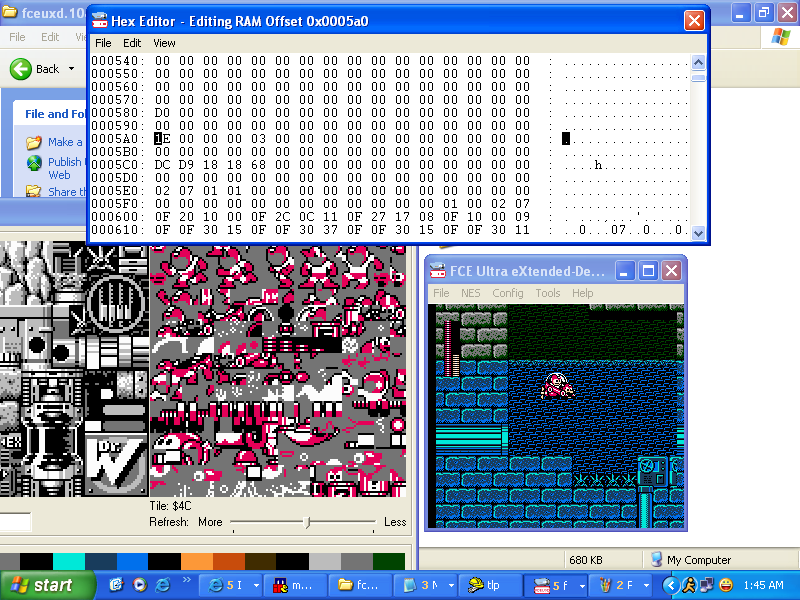 Hardman's tile data shows that the tiles for Wily's introduction. Other than that, nothing is interesting about it. Still, I gotta wonder at the significance of Geminiman's level. There's allot of oddities surrounding it. These are unused level tiles found in Sparkman's level. Maybe they were meant for Doc Robot's level, I really have no idea. Reminds me of Dustman's level from Megaman 4. Placing them back into the game reveals they're placed before Megaman on the screen, thereby obscuring the view of the player somewhat. Found by the Cutting Room Floor. Seems like Sparkman's stage was supposed to have some pretty nasty spikes. Putting them back into the game shows they still work! Maybe for the Doc Robot stage? Who can say? Now, Magnet's level tile data is VERY interesting! Those happy faces MUST be an in-joke for unfinished portions of the graphics and we see some destroyed bits of piping and brumbling bricks. I've peiced together what must be some sort of trap. What makes this interesting is that it opens up the possibility of a Doc Robot level. Doc Robot levels have a "destroyed" theme to them, for the most part (it can be observed in both Sparkman's and Needleman's levels). Furthermore, an old screenshot showed that Magnetman's mugshot was in the upper left hand corner at one point. Because of the words "Megaman 3" in the background I thought this went no further than the concept, but if these tiles remain in the game there may very well have been a Magnetman Doc Robot level at one point. 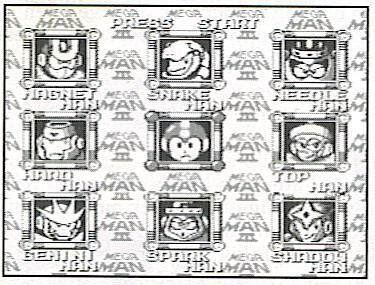 Megaman 3's menu was originally supposed to be surrounded by squares, but they get cut off by the screen. however, there's absolutely no such thing ... there's a "LDA 1A JSR F835" (which is what makes the original image show up for that get weapon screen) ...but no "1B". While there's no official record of where this image belongs, we can narrow it down using logic. 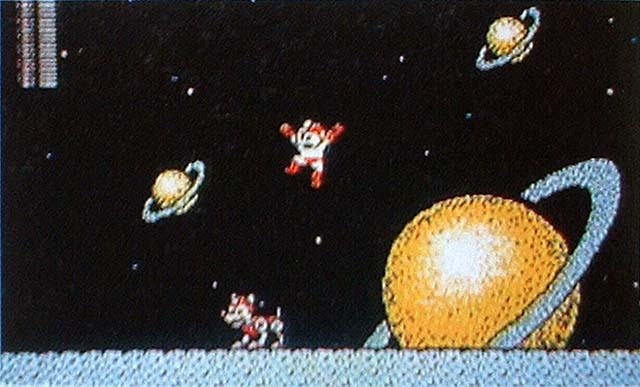 It might belong to the end of the game somewhere, as Megaman look to the sky at the end of the game. It might belong to an alternate version of the "get weapon" sequence. 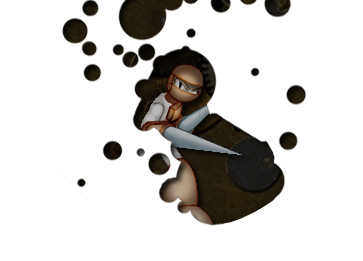 And it might belong to the title screen (as that is yet another instance of the "get weapon" image). Placing the image at the end of the game was my knee-jerk reaction, but it really has no place to go; unless there's alot more that was deleted from Megaman 3. While it can be placed in the "get weapon" sequence, it really doesn't fit there (as Mike's image attests). However, it could easily be placed in the Rockman 3 title screen, where the same "got weapon" image was used. Furethermore, it makes sence that it would be placed there as it would allude to the end of the game (a rare bit of storytelling from the origional series). So, that's where I think it goes. Gotta give props to Nekromancer / Heatman of Sprites INC for this juicy piece of info! Found in the same data block as the mugshots, "get weapon", password, and RM "named" screens, this is part of the "introduction to Skull Castle" sequence. See it by putting int he Game Genie code EAXAAAAA + ELXAPAO and AGXAAAAA + ELXAPAOL. The NES has 2 graphics layers- background and sprite. Animated backgrounds, even simple parallax effects, must either be done by updating background tiles, updating palettes to make certain pixels visible/hidden, or updating scroll values. The Gemini starfield effect, iirc, consists of some actual star tiles in the background, but also a number of star sprites in the sprite layer (the sprite stars disappear along with all other stage sprites when the pause menu is opened, and are drawn in front of the ground when they ~are~ visible). The NES has only 64 sprites which can measure either 8x8 or 8x16 pixels, and only 8 sprites will be drawn on any given scanline, so when the screen shifts to the sprite-intensive explosion of the plug, they probably needed to reassign the sprites used for stars to other locations or get them offscreen so they wouldn't interfere with enemy and player prites. This is probably why many or all stars disappear as you progress through the Gemini stage. Also, the plug itself may interfere with the background stars. Scanline catching and parallax can be tricky to code, and they probably didn't want to implement 2 different versions for one level. The scanline separating the scroll position of the background stars from the scroll position of the ground can be no lower than the highest point on the ground because they're part of the same fundamentally static 256x240 image as the ground (imagine taking a picture in Paint, selecting only the top half and sliding it left or right relative to the bottom half). For the main above-ground portion of the level, they want the boundary as low as possible to maximize the volume of stars, but on the plug screen, the plug may stick up above that level, meaning either they'd have to set a new parallax boundary or give up on the starfield. With no starfield, they'd have the added plus of nothing to distract you from the Proto/Break transformation, which may have itself involved something drawn in the same screen as the starfield and, say, scrolled on vertically. The NES has 2 screens worth of background 'canvas' which can be set to scroll either horizontally or vertically. 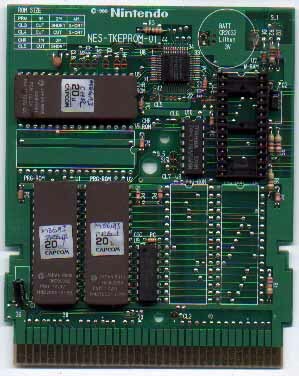 Some mapper chips can add 2 more screens and/or 2-axis simultaneous scrolling. The fact that the Protoman scene is a marked screen change from the rest of the level may indicate that they change the background mirroring/scrolling from horizontal to vertical at that point. Envision drawing the main level as the way it is in the cart level map- with a completely black starless background- and then in another image the same size, draw a starfield. Copy the whole starfield image, lay it down on top of the background map at the lowest point at which it doesn't overlap ground, and slide it left and right as I mentioned earlier to get the starfield effect and explain why it's okay that the basic map background is flat black. Envision drawing the plug scene as it is in the final game- with a black, starless background- but in your second screen draw a big ol' Independence Day vertical laser beam. Imagine taking this image and dropping it straight down from above over the top of the background image. Something like that could be worth sacrificing the starfield for. So they blocked out the planet for the style of the starfield. The screenshot is provided by Vixt of RMPM, of the planet properly implemented in the Rockman 3 Endless hack. Unused Proto/Breakman sprites. And, no, Protoman and Breakman do not share the same body despite the only difference being their heads. 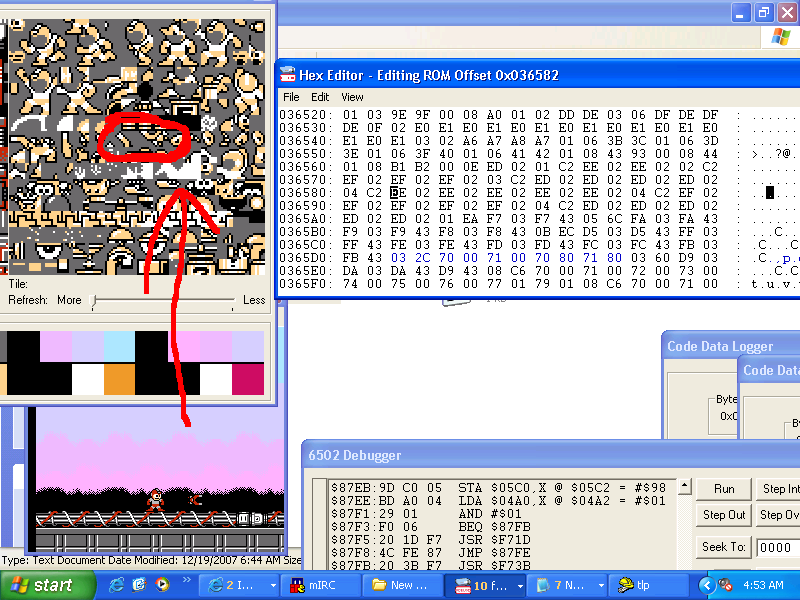 Of particular not eare sprites showing Protoman transforming into Breakman (as found by NES Boy). Mike Mcmahon has found the missing transformation data still in MM3 and has hacked Geminiman's level to include it. It makes sense that Proto changes into Break while in Gemini's level since he just stands around doing nothing there, although the non-linear nature of Megaman's level system suggests that this animation couldn't be in Geminiman's level originally. It might have been intended for Doc Robot Gemini's level. It's worth noting that Breakman is invulnerable to Master Weapons while Protoman is not, suggesting that the Breakman "transformation" was supposed to be a powered up version of Protoman. There's also sprites of Protoman / Breakman shooting while on the ground, suggesting a different attack pattern at some point. Protoman's Theme - Everyone knows that Protoman's theme song was originally longer. I think the credits were supposed to roll while Megaman started at Protoman's mugshot in the sky. Protoman's Whistle - While most people know that Protoman's Theme was cut short, most don't realize protoman's whistle was also cut short! Probably because it's a little too long and would interrupt the flow of the game. Wily's Castle - I was pretty surprised to hear that Skull Castle's introduction music was cut short! While it is pretty catchy, I can see it getting annoying to wait so long before moving on to the next level. What's interesting is comparing it to it's two doppelgangers in the in-game NES MM3 tune, the in-game WW SC tune, and the game-ripped WW tune. Perhapse it's the emulator, bit the music for the Wily Wars plays MUCH slower in the game .... not that that's the point. You can tell that the actual tune is what the in-game NES version playes, but looped over and over. That isn't even a game-trick, that's just the tune. It's almost as long as the original, but not nearly as catrchy. Unknown sound effect 1 - track 26 in the NSF file - somewhat difficult to distinguish, but this formerly unkown sound effect is a common bleep heard when an arm cannon shot bounces off a met's hat an such circumstances. Found out by Mega Man 5.
sounds kind of like a chime, similar to the sound of picking up a coin in Super Mario Bros. It's used in the game after you defeat a robot master and gain his ability, but whatever sound channel(s) it uses to make the effect are already in use by the sound effects of the new power's energy meter being filled up and/or the "blooping" sound of the weapons menu appearing on screen. 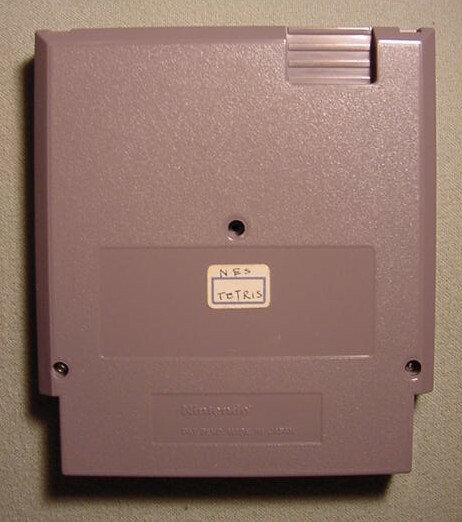 Because of the NES's hardware, you can't hear both sounds at once -- BUT, if you play Mega Man 3 on the PS2/etc. Mega Man Anniversary Collection, you CAN hear it, since the system uses pre-recorded audio instead of generating the sound itself. Unknown sound effect 3 sounds like it might belong to the Pickle Dozer ( the met driving the bulldozer). The rest sound like sound effects from the development stage of the game. Dr Right and Dr Wily have a symbol for when they collaborate on projects! It can be seen on batteries found in Magnetman's stage. I know I didn't notice this the first time I played though the game. The number of the Robot Masters are in is determined by the order their levels are set in inside the game. This can be seen by accessing the levels in any level editor program. First comes Needle then Magnet then Gemini, the Hard, then Top, then Snake, then Spark, and finally Shadow - just like the numbers say! 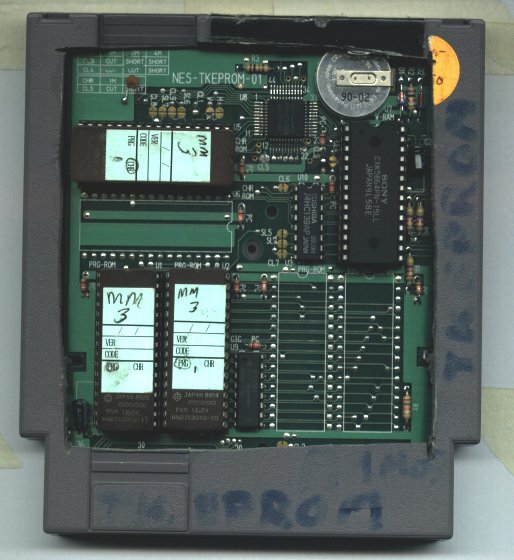 The rom level order is the same as the teleport hatch layout - from the top right going down, followed by the two on the bottom, and finally followed by the top left going down. 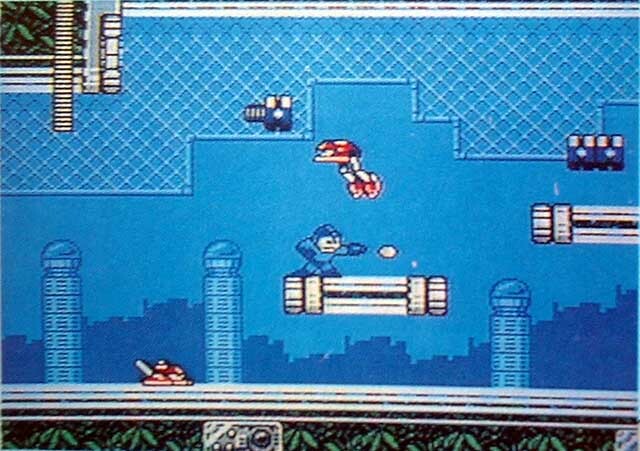 All of the Wily levels share the same tile sets! Only the pallets have changed. After the levels are over, there's still room left. In it are garbled bits of data and what appear to be bits of test layouts for bits of various stages with little or no changes. Just kibbles and bits and bits and bits. This is true for most all of the Megaman games, except for most of Megaman 1. The left is tile data from the Megaman 3 rom and the right is tile data from the Wily Wars (which I got using Genecyst and an old computer). As you can see, the tile data in Megaman 3 is NOT the same as the tile data in Wily Wars. The unused sprites and graphics in MM3 do not appear in the Wily Wars (or Mega World) at all. Allot of streamlining seems to have been done in that game. In MM3 Wily jets ti a mysterious area. One assumed it's supposed to be Skull Castle (and it's edited to be such in the Wily Wars as shown in the final sprite), but it doesn't look anything like it! An earlier design, maybe?